It's dark. Tawny. It smells wonderful; it's got that distinctive Glenfiddich pear scent, though there's some banana and sherry in there as well. It goes down very smoothly, with a vanilla finish that leaves me wanting more. A Smorgasbord of Sumptuous Spirits - WhiskyFest Chicago 2008! So, Friday night rolled around, and I found myself in the possession of a ticket to WhiskyFest Chicago! A VIP ticket no less; this means I got to enter an hour earlier than mundane ticket holders. It was a blast. Showed up at 5:30 (an hour before the *sniff* non-VIP riff-raff) at the Grand Ballroom at the Hyatt Regency Chicago. Registered, picked up a canvas tote bag full of swag (pictured), entered the main area, and started tasting! Rough, quick, dirty notes below. Attended one of the seminars they held – “The Incredible Influence of Wood at Glenfiddich,” with Ian Miller, the Global Brand Ambassador (how do you sign up for that job?) at Glenfiddich. We tasted samples of cask strength first-fill American oak aged malt (light and peary), as well as cask strength first-fill European oak aged malt (dark, syrupy, and sherried), both 12 years old. Then we compared them to a mixture of the two, and to the bottled 12 year old Glenfiddich malt. Then we did the whole thing all over again with 18 year old samples. It was really interesting to see how the different component malts tasted, and how the bottled malt compared to them. 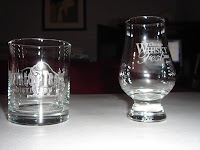 Anyway, I strongly recommend that you check out WhiskyFest if you get the chance. I had a great time, learned a lot, and got to try a lot of new whiskeys. Well done! Bushmills 1608 – sweet, caramel. Very good. I see that Binny’s carries this now, which is excellent. 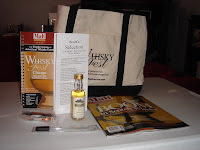 Bushmills Malt 21 – fresh, like the Malt 10, but a little sweeter and less harsh. Quite nice. Oban Distiller’s Edition – bananas. Sweet, malty. Excellent. Johnnie Walker Swing – sweet, smoky, and tasty. Johnnie Walker Blue Label – smoother nose than the Swing, but smokier and spicier. Very good, but not $200/bottle good. I’d recommend the Swing over this, for the price. Antiquary 12yo – a blend, and my first real encounter with peat smoke! It’s faint, but recognizable. Creamy. I like it. Tomatin 18yo – mint and malt. Smooth, citrusy, and very much a Highland Scotch. Good! Greenore 8yo – this is a single grain Irish whiskey. It’s been hard to get in the US, but Binny’s has it now! White chocolate and coconut. Very, very good. Four Roses Small Batch – bourbon. It tasted bourbonny. I’d need to drink more bourbon before I could taste this stuff properly. Good, though. Four Roses Single Barrel – ditto. Balvenie 21yo Port Wood – fruit; pears and melon all the way. Delicious!! Balvenie 17yo Sherry Oak – not much to say except fruity, in that sherry kind of way. Very good, but can’t compete with the 21yo. Scott’s Selection Glenlivet 1977 – also cask strength. Roses, spice, and vanilla. Good, but by this time my nose and tongue were getting tired, so it seemed unremarkable to me. If I tried it again now, I’d probably enjoy it a lot more. Laphroaig Quarter Cask – my first Laphroaig, and my first true peated Islay, if you don’t count the Bunnahabhain 12. Heavy peat smoke was about all I got out of it, but I thought it was really quite tasty. Makes me look forward to the bottle of Ardbeg 10 I’ve got sitting at home. Famous Grouse Malt Whisky 18yo – a vatted malt. This was one of the last I tasted, so I couldn’t get the full taste of it. It struck me as being decent, but nothing to write home about, and not nearly as tasty and the excellent standard Grouse blend. Laphroaig 10yo – about the same as the Quarter Cask. I should try it again sometime when my nose and tongue are fresh. Stranahan's is one of a very few single malt American whiskeys. Unlike bourbon, Stranahan's is made solely from malted barley, just like Scotch is. Only this stuff is 100% American -- the barley and water come straight from the Rockies. It's only aged for two years, which makes me wonder how it can be so dark. This stuff almost looks like a Macallan or an Aberlour. Caramel coloring, maybe? Adding water helps. Now I can elbow my way past the nail polish remover to get to the banana and vanilla that were ducking down behind it. Still sweet, all the way through. It's not my favorite, but it is nice. Eccentric, too: the label tells you in handwriting not only when it was distilled and what batch it's from (#7! ), but also who did the distilling (all I can make out are the guy's initials, J. N.) and what he was listening to at the time (Bob Wills). And if that weren't enough, the cork-sealed bottle is actually capped with a tall metal shotglass. I'm not sure who's hauling around an entire bottle of whiskey without proper glassware, but if you should find yourself in such a position, you'll be good to go if that bottle is Stranahan's!